When invited to outline their key challenges in ‘Difficult Conversations’ / ‘Managing Conflict’ courses, being able to say ‘no’ effectively to a request or a demand is high on most participants wish lists. William Ury identifies the core challenge of saying ‘no’ is that it seems to force us to have to make a decision between exercising power and maintaining the relationship. We get caught in an either/or dilemma when what we should be aiming for instead is how we can hold our boundary AND maintain the relationship. Ury advocates we strive towards what he terms ‘a positive No’. A first rule of thumb is to ensure you are respectful. This doesn’t just mean saying ‘No’ in a calm and sensitive tone. A respectful ‘no’ means taking the time to engage with the other person, listening to their concerns, acknowledging their needs and valuing them and their needs even though on this occasion you may not be able to satisfy the substantive request they are making. Harvard Negotiation experts Fisher and Shapiro (2005) identify what they term core baseline needs common to most people. 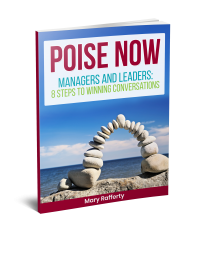 Addressing these core concerns (appreciation, affiliation, autonomy, status, and role) leads to more successful negotiation as well as minimising the level of conflict generated. Interestingly many of these can be easily addressed at little or no tangible cost. They do however require a shift in mindset – from seeing this person and their demands as something to be swatted away like a buzzing fly to having positive regard for them at a basic human level. For example, regardless of what level of difference might lie between us and another person, all of us are capable of ‘appreciation’ – simply acknowledging to the other person that we listen to and appreciate the merits and difficulties of how they think and feel and that we endeavour to put our key message across to them in a way that they will understand. Consider taking a broader view of what people might need and your ability to fulfil some of these needs. At a superficial level it might seem like you cannot grant their request. The substantive and overt issue might seem incompatible with what you can provide. A classic example is where someone has to be turned down for a job they’ve applied for. It would seem time-wasting to engage in anything other than a ‘dear John’ letter or email to break the bad news. However, if we take a more considered approach at what that person’s needs might be in that situation, we see that they have other needs that we might be able to satisfy. For example they might have a need for acknowledgement and recognition of what they did do well. They might need to hear specifically what they can improve on the next time and perhaps most importantly, they probably will benefit from some reassurance and encouragement to keep on trying. A common trap we fall into is that in striving to be what we believe to be assertive and strong in holding a particular line, we deliver our message in an overly forceful manner. Anticipating resistance, we mistakenly think a vigorous tone will deter them from pushing back against us. In reality what this often does is to provoke the person and invite further argument. What can also contribute to an unhelpful tone is that we ourselves aren’t in a completely calm and unruffled state of mind. We might be feeling frustrated about the substantive issues, we might be feeling nervous about their possible reactions. Or we might be feeling guilty about what we have to communicate. All of these will impact on our own emotional state and that in turn makes us more vulnerable to communicating in a less than optimal way. This calls for us therefore to spend time in advance not only considering what needs to be said but more importantly, taking whatever steps we need to take to develop a calm and centred state of mind or at least, to effectively manage our anxiety or irritation. Does it have to be an absolute ‘No’ ? It’s always worth considering whether our ‘No’ needs to be so absolute. What is our motive for the refusal of what’s being requested? Are our emotions driving it rather than our thinking, e.g. fear of setting precedents, fear of losing control or just lack of time to think things through properly? For example, let’s suppose someone is asking for time off during a very busy period. They knock on your door and before they have uttered half a sentence our instinctive response is to refuse. However, you take the time and hear them out and realise that their request for time off is to attend to a family matter which while not life threatening, is of significance to this person. Equally, you present to them your concerns about this and the possible impact on the work being done. Then you both spend some time brainstorming about ways to meet both your need for the work to continue and the other person’s family needs to be addressed. feel empowered to respectfully, yet steadfastly, enforce any consequences. So remember ‘no’ comes in many shapes and sizes – make sure your one is the right fit for the situation! Bringing Out the Best in People: A Social Cognitive Neuroscience Perspective... Anti-Bullying Policies – Fit for Purpose?